For-profit colleges have elicited wildly divergent reactions, with critics vilifying them and their executives, and supporters seeing in the institutions a necessary and laudable complement to public and non-profit institutions. As I propose to argue in this chapter, the truth likely likes somewhere between these extremes. 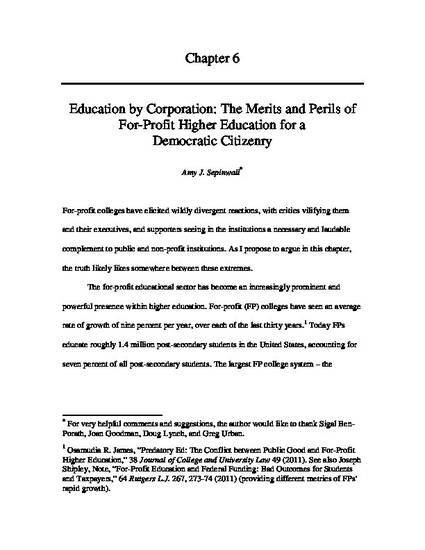 Commentary on for-profit education proceeds along three narratives: the first views the for-profit college as a kind of villainous, unstoppable monster; the second, contrastingly, sees the for-profit college as a kind of savior; and the third takes a more nuanced position, identifying virtues of for-profit education while expressing concern about its compatibility with education’s traditional democratic aims. I present and critique each of these narratives in turn.